Rachel Ann Bovier poses outside of the WESA studios on Thursday, Jan. 17, 2019. A Halloween-themed billboard sits at the intersection of Bigelow Boulevard and Herron Avenue. Pittsburgh poet Rachel Ann Bovier's final billboard included a Thanksgiving-themed message. Lamar removed the message in December after funds dried up, Bovier says. The billboard came down in December—according to Bovier, because of a lapse in funding—but the poet is still writing and answering strangers' calls. She's also resumed publishing her poetry in the Post-Gazette, a practice that preceded the billboard but ceased when she realized she could offer the same work "but much bigger." In addition to her return to print, a local filmmaker has made her the subject of a documentary. Directed by Squirrel Hill resident and Carnegie Mellon University professor Brett Yasko, the film will serve as a look at a day in the life of Rachel Ann Bovier. Yasko says it should premiere later this year. This moment in the spotlight comes as a surprise to Bovier. She says she hopes to bring happiness to people through her words. 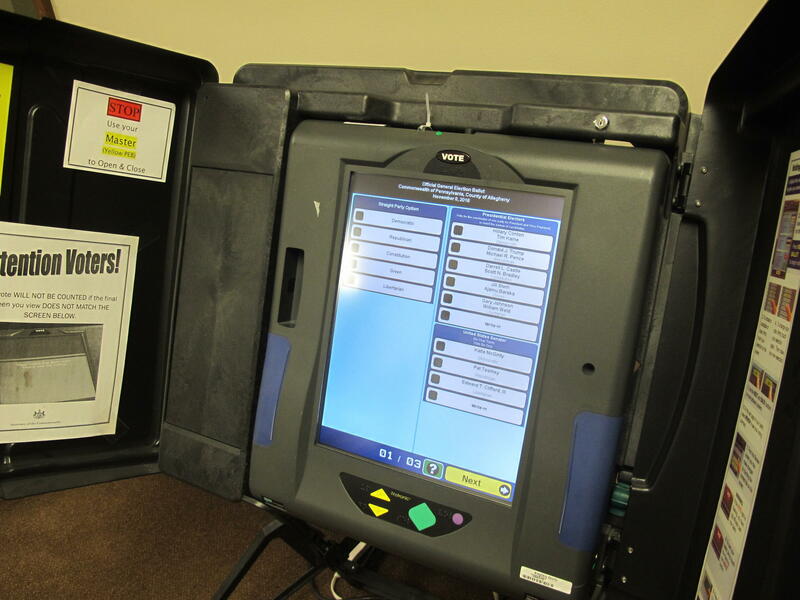 Included in the commission's recommendations were implementing new machines that produce a voter-marked paper record. Later in the program, local hip-hop producer, deejay and beat maker Buscrates has made a point of creating music unique from what typically lands on the charts. The Pittsburgh native lived in Atlanta for a time and was a part of that city’s thriving hip-hop community. He recently moved home to find the places he frequented in the late 1990s and early 2000s no longer exist. To adapt, Buscrates says he's seeking for inspiration in new ways in his hometown. Gov. Tom Wolf kicked off the new year with an ambitious climate change goals: reduce Pennsylvania’s greenhouse gas emissions 26 percent by 2025 and 80 percent by 2050. Pennsylvania is the nation’s fourth-largest emitter of carbon dioxide. 90.5 WESA's Amy Sisk reports that to meet these goals, the state will need to implement policy changes as well as smaller strategies to make Pennsylvania a greener state. Sisk joins 90.5 WESA's Reid Frazier for an event in Pittsburgh tonight with StateImpact Pennsylvania. And the Blue Ribbon Commission on Pennsylvania’s Election Security issued its final report this morning on ways to make the voting system in Pennsylvania more secure. Co-chairs David Hickton, founding director of the University of Pittsburgh Institute for Cyber Law, Policy, and Security, and Paul McNulty, president of Grove City College, explains what they think Pennsylvania should do to prepare for 2020. The entire Blue Ribbon Commission’s report is available here.